My favourite Christmas movie of all time would have to be Die Hard. While it may not have the wholesome family fun and good morals that make up a typical Christmas film, it’s still a film set on Christmas Day and most people would agree that qualifies it. So when I heard that the current (Volume 3) series of Wolverine had an issue that was often described as Wolverine meets Die Hard, I got pretty darn excited. How hard would it be to mess that up? As it turns out, it’s not hard to mess up at all. Wolverine #49 opens with Logan being forced to Christmas shop at the behest of Kitty Pryde as he makes a stopover in New York. The mall he chooses to shop at also is being visited by Toulouse Lexington, the daughter of a very wealthy man, who is then kidnapped by a gang masquerading as a Santa act. Usual kidnapping antics ensue, as Wolverine attempts to save the day. If that description sounds derivative and clichéd to you, it’s because it is. Nothing here is even remotely unique to Wolverine’s character, and he could have easily been replaced by any number of superheroes within Marvel’s catalogue, or even John McClane himself. We barely see him, and his powers only become handy twice in the entire comic – even then a number of other heroes could have dealt with it too. It almost seems that writer Rob Williams had a basic story ready for whenever he had the chance to fit in a hero he was working on at the time. That’s not to say any other parts of his by-the-book hostage story are particularly good either. The gang who are clad in Santa and Elf outfits have the privilege of having the stupidest name a gang could have: “the Black Christmess”. They jump from having one motive to a completely different one later in the story, and any attempt at making them even remotely sympathetic is lost. There is even a small sub-plot regarding the heiress and her relationship with her estranged father that is picked up, and then promptly forgotten. Nothing here feels particularly fleshed out, despite the fact that most of the issue is characters explaining themselves, leaving the action in the back seat. Laurence Campbell’s art isn’t too bad – the environments are well detailed, and he has some fairly cool action shots thanks in part to Kris Justice’s colours. But the side cast all look like fairly generic stock characters, except for the heiress Toulouse, who actually looks like a librarian rather than the daughter of a wealthy business man. 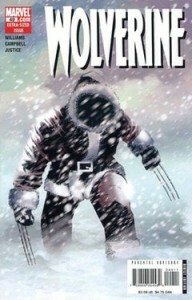 Wolverine #49 is a poor attempt at making an action story set during Christmas. There is little action to keep you entertained in the mess of a story that could easily have its characters switched out without you even realising it. If you want to watch a man kill hundreds of terrorists on Christmas, stick to Die Hard. Wolverine #49 is definitely not worth your time.